What punctuation was used in Classical Latin? Many Classical Latin textbooks typeset their texts with (small and capital letters and) a broad selection of punctuation, like period ., comma ,, colon :, semicolon ;, exclamation mark !, question mark ? and possibly more (e.g. en dash –, etc.). Which (if any) of these were actually used in Classical Latin, and what, if not punctuation, was used instead? We should first recognize that there was not one system of punctuation in use during Classical times. However, all of modern punctuation, including commas, periods, colons, semicolons, etc. are more recent, not just for Latin, but for European languages as a whole (and in fact worldwide, as e.g. Chinese borrowed the question mark). Not only that, but word spacing too is relatively recent. Many early manuscripts lack any punctuation and word division. However common this was, there were some variations. In a dedication to Castor and Pollux (ca. 550–525 BCE) in between "to Castor" (CASTOREI) and "to Pollux" (PODLOUQUEI) there is word division indicated by an interpunct ·. You may also note in that inscription that a slash \ is used for sentence division. Finally, because the letter I in Latin was used for both a vowel (long and short) and a consonant (having the IPA value of j), it was not infrequently drawn particularly elongated. Baldi, Philip 1999. The Foundations of Latin. de Gruyter. Bodel, John 2012. "Paragrams, Punctuation, and System in Ancient Roman Script," in The Shape of Script ed. Stephen D. Houston, Santa Fe, pp. 65–92. Sacks, David 2007. Letter Perfect: The Marvelous History of Our Alphabet From A to Z. Random. Most Latin documents, regardless of type, had very little in the way of punctuation (p. 22). Archaic Latin. Written mostly in scriptio continua (i.e. often no word breaks or punctuation between words); sometimes, interpuncts were used between words (including two or three vertical interpuncts). Late Latin. Interpuncts for separating words became less common and were used to mark phrases. What's really interesting about interpuncts is that they were normally added after the text was inscribed (Edmondson 2015: 127). Indentation as well as empty space was used in longer texts to mark paragraphs, e.g in the Lyon Table. Hodgman, A.W., "Latin equivalents of punctuation marks", The Classical Journal, 19 (7), 403–417, 1924. Latin sentence structure has very clear equivalents for some of our punctuation marks, but not for all of them; and it has its own methods for expressing certain things for which we have developed other typographical aids. The paper mentions among others, the following equivalents of modern punctuation. -que (or neque or atque) is often an equivalent of a comma in front of the word. marked by question words such as quis, etc. It is probable that most written text were not punctuated at all. The main punctuation used in inscriptions (on monuments, sculptures, etc.) was a central point · or interpunct, by opposition to the low point we currently use) to separate words, or to separate initial letters of abbreviations (eg S.P.Q.R.). Large inscriptions you can see in Rome have been restored, sometimes several times, or put on old monuments many years after their construction so one must be careful when drawing conclusions from them. Most texts we have are manuscript copies of the middle ages. Each generation, country and abbaye used its own abbreviations and conventions, so we do not have a clear idea of the non-letter notations of the roman authors. We know Romans used several forms of stenography to take notes during speeches, but we have little testimony of how it was written (wax tablets for instance were constantly reused, and do not age well). That center point is called an interpunct. 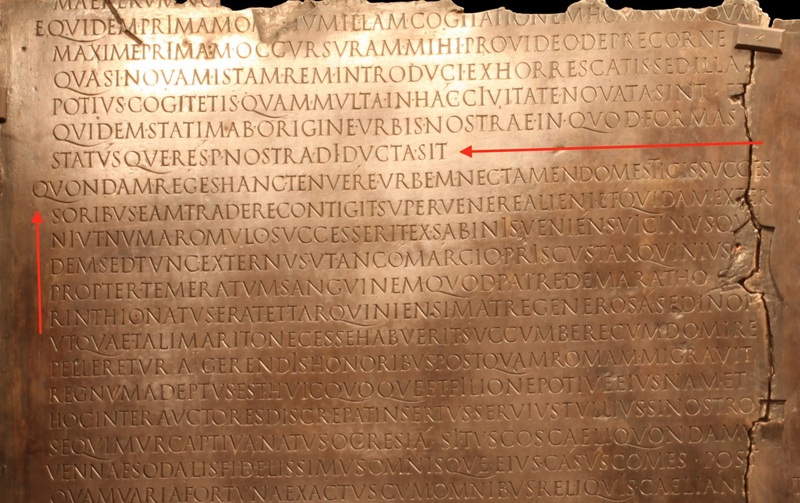 How to tell when an inscription is post-classical? When did scriptio continua and interpuncts give way to spaces between words in Latin? Was Classical Latin syntax complex on purpose?